Instagram "Aldiatsunset" documents area Aldi stores at sunset. LOGAN SQUARE — A graphic designer and frequent Aldi shopper has turned the discount supermarket chain into her muse by documenting the stores at sunset in a series of Instagram posts. "Goodnight, sweet prince. 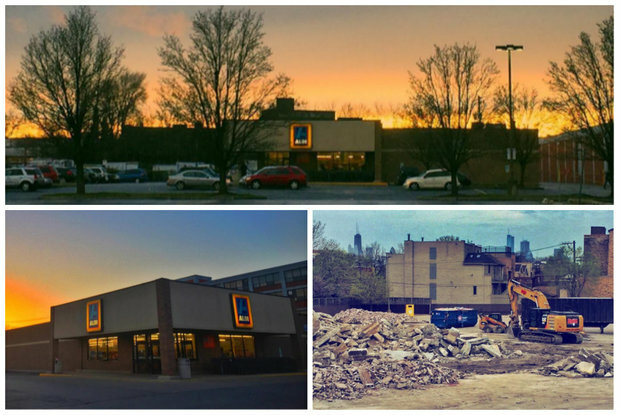 This Aldi saw its last sunset this week before it was torn down. So young, so innocent," @aldisunsets posted on Wednesday, showcasing a pile of rubble at the site of a just-demolished Aldi. That Aldi, at 1767 N. Milwaukee Ave., shuttered last month but will be back, as an anchor to a 95-unit apartment building slated to start construction soon. Isabel Calder, a 23-year-old Logan Square resident, launched Aldi Sunsets four weeks ago and has amassed 520 followers. "Turns out there are people out there who love Aldi as much as I do, a large sunset fan base on Instagram and a group who delights in weirdly specific accounts. I've really enjoyed having a passion project for no reason but my own enjoyment," Calder said in an email. Calder says she often captures the store before or after buying groceries. Since she lives closest to the Aldi at 3320 W. Belmont Ave., that Aldi is featured in about two-thirds of her photos. Calder traces the inspiration for her Instagram account to a photo of an Aldi sunset she snapped in August. Though the pink and blue sunset over Aldi was "just a one-off snapchat," Calder saved it to her phone because she thought it was pretty. "I didn't think about to again until this spring when my boyfriend and I were discussing Aldi and I showed him the picture. We made a joke that I should make a blog about it and here I am, one month later," Calder said. So far, Calder said her photos are inspiring other fans to snap sunset views of their Aldi stores. "There are some cool Aldi's out there! For example, there is one in the UK with a beautiful mural and one in Australia which overlooks the ocean," Calder said. Got a great shot of an Aldi at sunset? Send an email Calder or hashtag #aldisunsets.